Happiness Village. Photo courtesy GroundUp. Unused housing on Marievale military base continues to be at the centre of drawn out legal arguments between Lawyers for Human Rights (LHR) and the military with another application to overturn a North Gauteng High Court judgement expected. 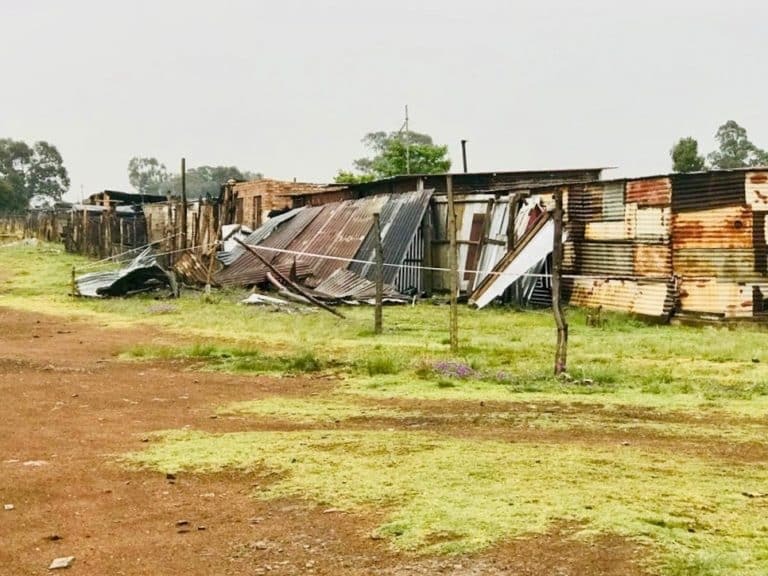 LHR took up cudgels for people, said to be unlawfully occupying housing on the largely unused east Gauteng military base, who were evicted, apparently with excessive force, in December 2017. A series of hearings in the Pretoria court followed with LHR on behalf of the evictees, now living in a shanty town they call “Happiness Village”, getting approval from the judge and legal teams representing the SA National Defence Force (SANDF); Defence and Military Veterans Minister Nosiviwe Mapisa-Nqakula; SA Army Chief Lieutenant General Lindile Yam and other officers, being told to accommodate them. LHR land and housing programme manager Louise du Plessis told defenceWeb after yet another court hearing last week it was “frustrating” and not helping people who wanted the national defence force to “simply” do what the court had ordered. This included putting proper partitioning in bungalows on the base to make them at least partially family friendly and providing potable water. On February 1 the North Gauteng High Court dismissed an application for leave to appeal by the SANDF and ordered the army to comply with previous court orders to accommodate evicted Marievale residents. The residents were forcefully evicted from their homes in the Marievale military base by the SANDF in November 2017. On May 9, 2018 the court ordered the SANDF to allow residents to return to their homes within 30 days. In November 2018 residents asked for the SANDF to be held in contempt of court because they had not yet returned to their homes or been given alternative accommodation. Judge Norman Davis did not find the SANDF in contempt but reaffirmed and supplemented the May 9 court order. The SANDF applied for leave to appeal this order. It argued its application suspended the November court order. Judge Davis dismissed this on Friday, saying the application lacked merit. He also ordered the SANDF to pay the costs of the application and accommodate the Marievale residents. Davis explained November 30 order did not change the fact that the army has to accommodate the residents. “It is common cause that (the May 9) order has not yet been implemented,” said Davis. Thandeka Chauke of the LHR land and housing unit said the interdict regarding alleged harassment of Happiness Village residents still stands. She said: “While the judgment confirms there was no compliance with the court order of May 9, 2018, there was no finding of wilful or mala fide contempt against the Minister and the army generals. It is concerning that contempt of court orders, particularly by the state and state officials, have become increasingly common. It is also unfortunate it had to be spelt out by the court for the SANDF to understand what they were initially supposed to do”. The national defence force’s legal team has until the end of February to file another application to appeal. Lawyers for Human Rights (LHR) said in court it provided the army with the names and ID numbers of the people who need to be accommodated, as ordered by the court. LHR said that Friday’s ruling should compel the SANDF to finally accommodate the Marievale families. “We are now expecting the SANDF to comply … otherwise nothing will stop us from making another application for them to be found in contempt of court,” Du Plessis said. “It is disheartening that we continue winning in court against the SANDF but to date we have not gone back to our homes,” said Lucy Malikele, an evicted resident.